From award-winning author Kevin James Breaux. Epic Dark Fantasy. Sample of graphic for use in the Press Kit. The press kit page for SOUL BORN is now up on my author site: www.kevinbreaux.com. Until then please go to: http://www.kevinbreaux.com/presskit4.htm and use whatever you want to promote the book. Kevin James Breaux has written seven books and devoted the past ten years of his life to crafting short stories and novels. He is a member of the Horror Writers Association, and the Science Fiction and Fantasy Writers of America. Breaux is always enthusiastic about the challenge writing presents. He lives by the motto “Write Makes Might!”© and sees each new page as an opportunity to improve and advance. Click here for a free .PDF short story. Soul Born for Sale at Publisher! Click here to purchase SOUL BORN directly from publisher. On sale! All Opal wanted was to be respected as a wielder of magic, but her teachers passed her over time and time again. When a mysterious warlord embarks on a conquest to destroy the lands of Illyia Opal seizes an opportunity to step out from the shadows of her instructors and take her rightful spot among them. Tala, an alluring young elf, was banished from her tribe, hunted and nearly killed by the beasts that dwell in the deep forests, but more than anything else she is a survivor. Joining forces with an ancient elemental power Tala finds herself in the center of an unrelenting human war. Flesh like leather and bone as strong as steel Karn, a veteran from the first kingdom to fall, is fueled by vengeance. While pushing ever headlong into battle Karn begins to recall memories of another life; ghosts that haunt his dreams. Through death of soul, their world is born. Fantasy Faction's 4/5 star Soul Born review here! 5/5 star review of Soul Born! Read a 5 star review of Soul Born here! BIG NEWS!!!! The Soul Born Saga is coming! SOUL BORN cover quotes and review quotes. Click here to buy SOUL BORN at BN.com in Nook or Paperback! Click here to buy SOUL BORN at Amazon.com on Kindle or Paperback! 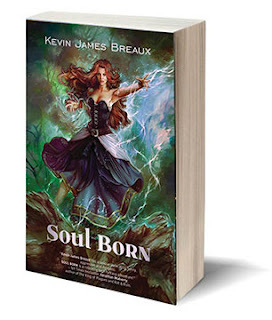 Soul Born and the Characters inside are Copyright - Kevin James Breaux 2010. Awesome Inc. theme. Powered by Blogger.